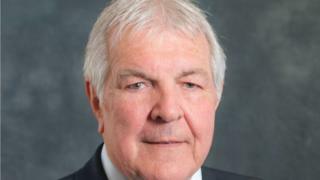 The Bridgend council leader is to stand down and retire from public service, he has said. Councillor Mel Nott, 73, will relinquish the role in October. He will not stand for re-election for the Sarn ward in the 2017 local elections. He was elected to Mid Glamorgan council in 1992 and then Bridgend council. The Labour member, awarded an OBE for services to the community, is stepping down to allow the group to find a new leader ahead of the 2017 elections.